Commercial HVAC Geothermal heating and cooling systems are a cost effective, energy efficient, and environmentally friendly way of heating and cooling buildings. Both the DOE and the EPA have endorsed the technology. GSHPs reliably deliver quality air-conditioning and heating, on demand, in every season. GSHPs are appropriate for new construction as well as retrofits of older buildings. Their flexible design requirements make them a good choice for schools, high-rises, government buildings, apartments, and restaurants–almost any commercial property. 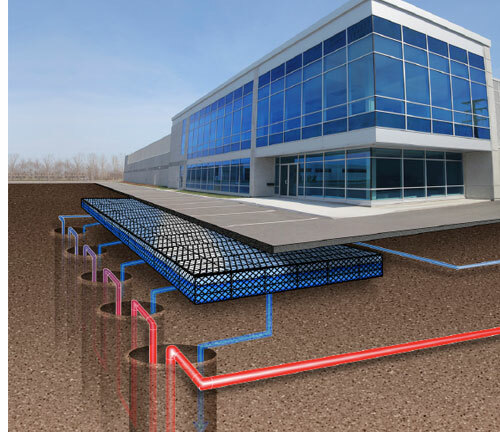 Lower operating and maintenance costs, durability, and energy conservation make Geothermal Systems the smart choice for commercial applications. Very competitive on initial costs and lower lifecycle costs than most HVAC systems. Some utilities offer rebates or incentives to their customers who purchase Geothermal systems. Read more about our Commercial HVAC services.